North Carolina is no stranger to the efforts of the gambling industry to expand casino gambling. In 2011, then-Governor Beverly Perdue signed an “Amended and Restated Gambling Compact” with the Eastern Band of Cherokee Indians (EBCI), which was the first step in enabling the Cherokee Tribe to implement “Class III” Las Vegas-style table games (such as craps, roulette, blackjack, and poker) with live dealers in North Carolina. The General Assembly followed suit in June 2012 by enacting legislation that authorized the EBCI to conduct these Class III games, and allowed the Tribe to operate up to three casinos. The U.S. Department of the Interior approved these changes in August 2012, and in October 2013, the Cherokee broke ground on a second casino near Murphy, N.C. that will reportedly hold up to 1,200 slot machines and 40-50 live table games. If that were not enough, it became public in August 2013 that the South Carolina-based Catawba Indian Nation is seeking to purchase land and build a 220,000 square-foot gambling casino and “resort” off of I-85 in Cleveland County, North Carolina (near Charlotte). Regional casinos are sold to the public as a “sure” source of revenue for hurting economies, with the promise of more jobs and increased tourism. But a groundbreaking new report from 33 noted scholars and policy leaders shows that regional casinos are a “regressive source of income for states” that ultimately bring harm to the communities in which they are located. According to the report, casinos prey upon the most vulnerable citizens for the majority of their revenue, weaken other businesses, and harm property values. Released in September 2013 by the Institute for American Values’ Council on Casinos, the report, “Why Casinos Matter: 31 Evidenced-Based Propositions from the Health and Social Sciences,” differs from the majority of other U.S. gambling studies by relying primarily on independent research that is not associated with or controlled by the gambling industry. The report argues that state-promoted casino gambling “is contributing to economic inequality,” and urges state governments to rethink their involvement in its expansion. Following is a compilation of findings from the “Why Casinos Matter” report, along with additional research, that shows why the social and economic costs of casino gambling far outweigh any potential, short-term benefits for communities. 1. 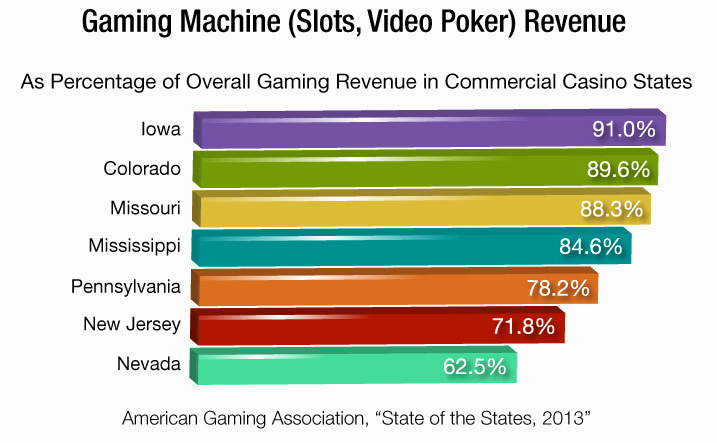 Today’s casinos are dominated by computerized slot machines, from which casinos derive the majority of their revenue. The number of legal electronic gambling machines, which include slots, has increased by more than five fold in the U.S. in less than two decades—from about 184,000 in 1991 to about 947,000 in 2010. 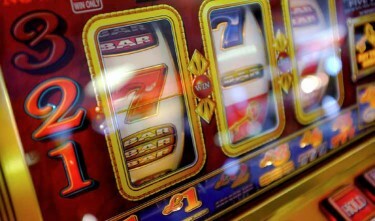 There are 3,145 electronic gambling machines in North Carolina, according to the American Gaming Association (AGA). 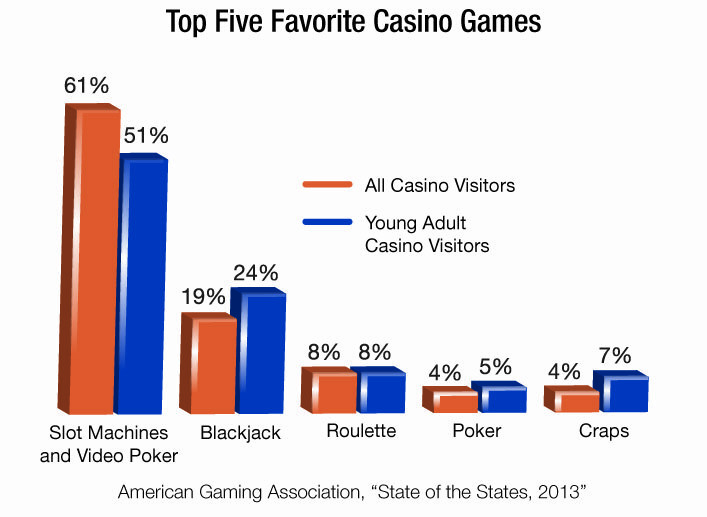 According to the AGA, 61 percent of casinogoers say that electronic slot and video poker machines are their favorite casino games. 2. Slot machines are highly addictive electronic devices that are designed to induce gamblers to spend more time on the machine and to play until all their money is gone. Electronic gambling machines (i.e., slot and video poker machines) have been dubbed the “crack cocaine” of gambling by experts. According to gambling addiction experts, it typically takes one to three years to develop a gambling problem with modern slot machines, versus five to 10 years with traditional forms of gambling. 3. Areas where casinos are introduced and expanded experience significant increases in the number of problem and pathological gamblers. Nationwide, it is estimated that over five percent of the adult population has exhibited the characteristics of pathological or problem gambling during their lifetime. The percentage of problem and pathological gambling among regular (or repeat) gamblers is estimated to be as high as 20 percent, according to Dr. Schull. A 2004 study found that individuals who lived within 10 miles of a casino had twice the rate of pathological and problem gambling as individuals who did not. 4. Casinos are disproportionately dependent on problem gamblers for the majority of their profits. One Canadian study found that “casual players comprised 75 percent” of the number of people gambling in casinos, while contributing only four percent of net revenue. The majority of casino revenue came from problem gamblers. 5. Increasing numbers of addicted gamblers create significant burdens for gamblers, their families, and society. Individuals who have gambling problems are more likely to suffer from other addictive behaviors, and experience increased depression and anxiety. Addicted gamblers are more likely to get divorced, experience financial hardship (bankruptcy/ debt), lose their home or job (or both), attempt suicide, and commit spousal abuse. Families of problem gamblers report increased physical and emotional abuse of spouses and children, divorce, child neglect, and alcohol and drug abuse. 6. In addition to increased gambling addiction, crime increases in areas where casino gambling is introduced. Addicted gamblers often resort to criminal activity to fuel their gambling addiction and/ or to pay off large debts. A report by the Attorney General’s Office in Maryland found that introducing casinos within the State would increase organized crime, child abuse, drug abuse, and domestic violence. In the first 15 years in Atlantic City after casinos were built, violent crime rose 199 percent and larceny increased 481 percent. In North Carolina, during the first five years of the Cherokee Casino, crime rates in that county were reported to have increased 25 percent, and the Jackson County police force increased by 40 percent, while the number of officers on the reservation increased by 33 percent. A survey of nearly 400 Gamblers Anonymous members found that 57 percent committed theft that amounted to stealing $30 million collectively to fund their gambling addictions (an average of $135,000 per gambler). 7. Gambling addiction and its associated costs are expensive for society. A 2010 national evaluation of gambling costs by Focus on the Family estimated that pathological gambling in adults costs about $12,205 per addicted gambler, per year in the United States. The report estimated that problem gambling costs $3,478 per adult problem gambler, per year. According to the “Why Casinos Matter” report, a “2004 study estimated the social costs of problem gambling associated with a new casino between $2,486 and $2,945 per problem gambler, and $5,143 to $10,330 per additional pathological gambler. Casinos hurt property values in the host community. For example, “research conducted for realtors in western Massachusetts, where a new regional casino is slated for construction, found that homeowners in the host community would experience from $1,650 to $3,300 in lost value.” The same study estimated an additional 125 home foreclosures each year. Casinos weaken other businesses, such as restaurants and bars, while increasing gamblingassociated businesses, such as pawnshops, check cashing stores, and payday lenders.